Resolution expressed "deep regret at recent decisions concerning the status of Jerusalem." The US was further isolated on Monday over President Donald Trump's decision to recognise Jerusalem as Israel's capital when it blocked a United Nations Security Council call for the declaration to be withdrawn. The remaining 14 council members voted in favour of the Egyptian-drafted resolution. What was the wording of the draft resolution? It did not specifically mention the US or Trump but expressed "deep regret at recent decisions concerning the status of Jerusalem." It affirmed "that any decisions and actions which purport to have altered the character, status or demographic composition of the Holy City of Jerusalem have no legal effect, are null and void and must be rescinded in compliance with relevant resolutions of the Security Council." The draft resolution also called upon all countries to refrain from establishing diplomatic missions in Jerusalem. Does the US use its veto often? No. It is the first time in the UNSC in more than six years, US-UN Ambassador Nikki Haley says. "We do it with no joy, but we do it with no reluctance," Haley went on. "The fact that this veto is being done in defense of American sovereignty and in defense of America's role in the Middle East peace process is not a source of embarrassment for us; it should be an embarrassment to the remainder of the Security Council." What did Donald Trump decide to do? He abruptly reversed decades of US policy this month when he recognised Jerusalem as Israel's capital, generating outrage from Palestinians and the Arab world and concern among Washington's western allies. Trump also plans to move the US embassy to Jerusalem from Tel Aviv. Palestinians want the capital of an independent Palestinian state to be in the city's eastern sector, which Israel captured in a war in 1967 and annexed in a move never recognised internationally. "What we witnessed here in the Security Council is an insult. It won't be forgotten," - US Ambassador to the UN Nikki Haley said after the vote. 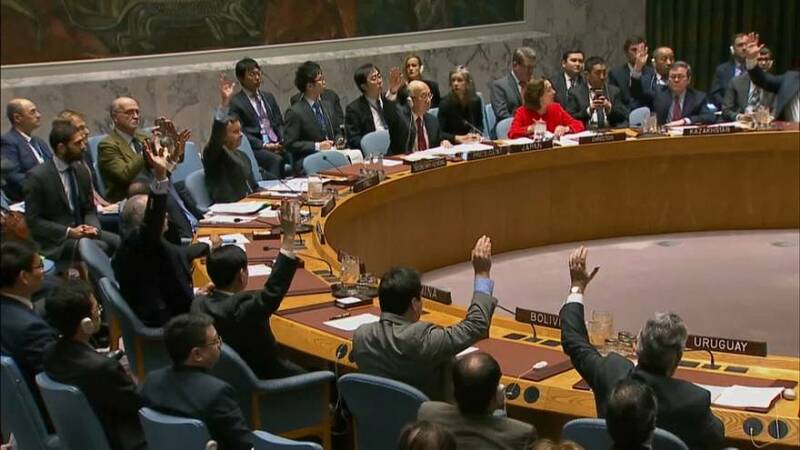 "In the wake of the decision of the United States..the situation has become more tense with an increasein incidents, notably rockets fired from Gaza and clashes between Palestinians and Israeli security forces," - UN Middle East peace envoy Nickolay Mladenov told the Security Council ahead of the vote.